When the Southern Expansion A-League bid was rejected in December 2018, Sydney FC probably breathed a sigh of relief. Across town, one can assume the Western Sydney Wanderers were marginally apprehensive – someone else had encroached on their territory. By October 2020, geographical rivalries will become clearer when Macarthur South West United is admitted into the expanding competition. The friction created by the Mexican stand off will test rapport between the three football clubs. In the next year or so, our current two Sydney sides will have a final opportunity to appease and engage new fans, before the southwest is forever stamped with the Macarthur branding iron. Luckily, Sydney FC and the Wanderers have always been ahead of the game. Long before the winning A-League bid was announced, each rival team had been litmus testing the area. 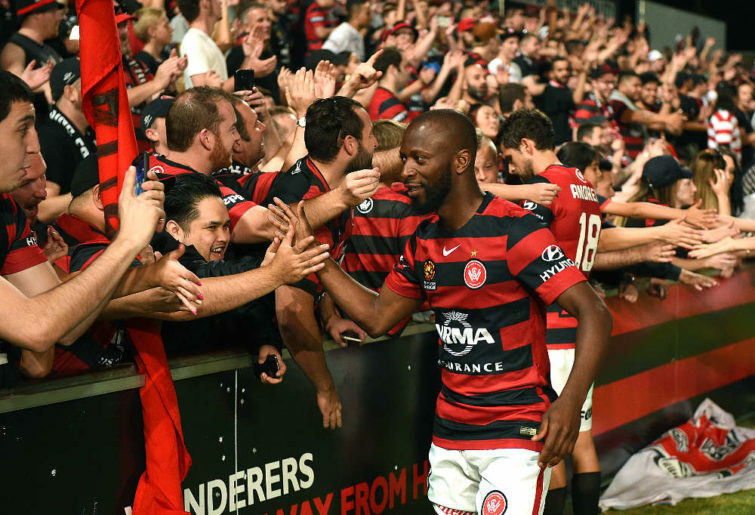 For the Wanderers, playing selected games in Campbelltown was the perfect elixir for success. Respectable crowds turned up to both FFA Cup and Asian Champions League matches. The Cumberland Plain, it could be speculated, was evidently Red and Black Bloc territory. Similar to gold prospectors searching for nuggets, boundaries in the A-League have been altered, crossed and pushed over the years. It appears Moore Park wasn’t big enough for the sky blues who surely dreamt big. Keep in mind, their growing influence over the greater west is warranted. More than 5,000 fans turned up at Campbelltown Stadium to watch Sydney FC play Wellington in Round 20. Yet, laying claim to a new area in a two-way street. In 2013, when the Central Coast Mariners considered advancing south to play more games at North Sydney Oval, the Sky Blues quizzed the unwanted intrusion. Sydney FC chairman, Scott Barlow, announced there was only one sheriff in town. “As for them (Mariners) playing one community round game at North Sydney, that’s OK, we don’t see that as a problem – but anything more than that, we wouldn’t tolerate,” Barlow told the Sydney Morning Herald. For the positive growth of football in Australia, hopefully Macarthur South West United has a solid first year. They’re competing with two powerful clubs who want to completely dominate the Sydney market. For punters, a friendly turf war awaits. Perchance, in the near future, Macarthur also needs to cross the line too. Best of luck.